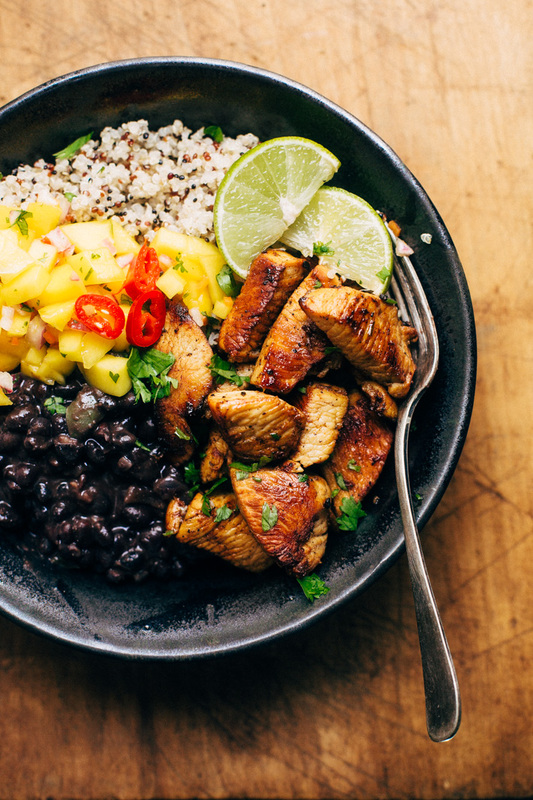 Cuban style mojo chicken quinoa bowls are hearty and filling. 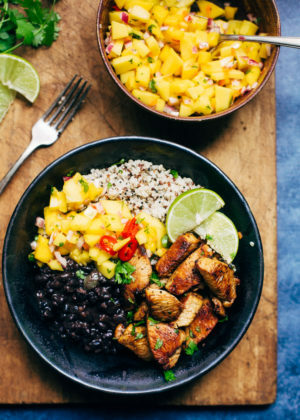 It starts with marinated and seared chicken followed by homemade black beans and a quick mango salsa! This ones BOLD on the flavah! 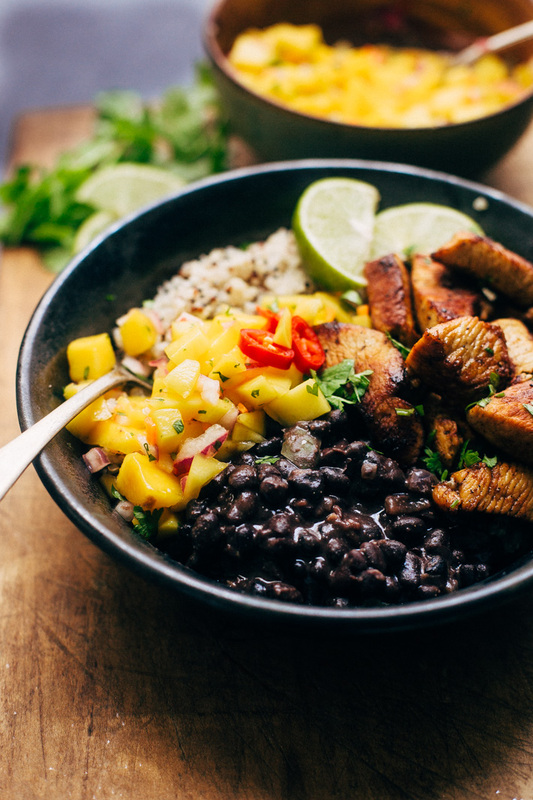 I can and WILL stuff my face full of mojo chicken quinoa bowls topped with mango salsa and cuban black beans that are made totally untraditional with chopped cilantro, garlic, and a healthy squeeze of lime. Who would I be if I claimed authenticity? A faker. I’m just here to say, lets put a bunch of yummy components together on a plate and swoon over each bite as the sweet, tangy, spicy flavors mingle and tease our palettes. This stuff is addicting. Now couldja pass me the mango salsa, pleaseandthankyou. ?? Y’all my MOUTH lives for food like dis. 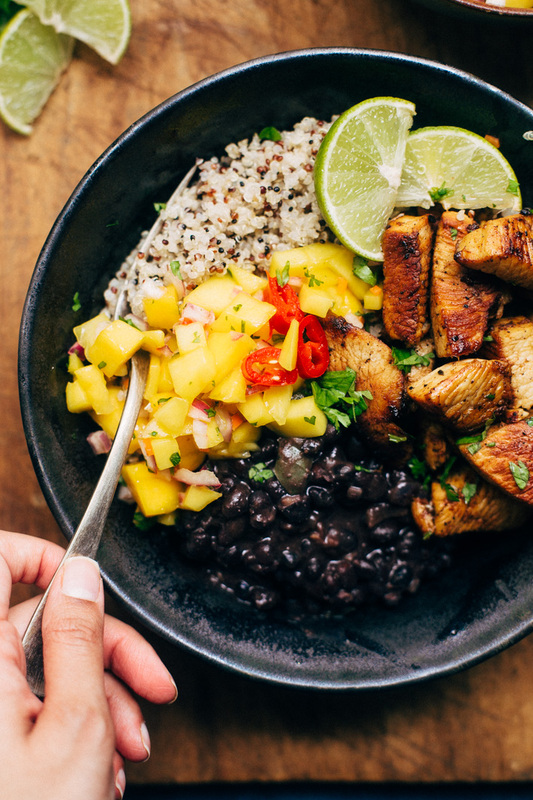 These Cuban inspired Mojo Chicken Quinoa Bowls are the best thing to come out of my kitchen! And i’m not just saying that because i’ve been in somewhat of a food rut. Totally uninspired and completely lost. Currently straddling the line between late winter comfort food and an early spring system cleanse. My body wants a system reset while my mind urges me to twirl a little more pasta, grate a little more parm, forgo the gym this morning, and snuggle a little deeper into my habitually inviting blanket. Eating in the middle is what we’ll do. A little bit of this and a little bit of that. 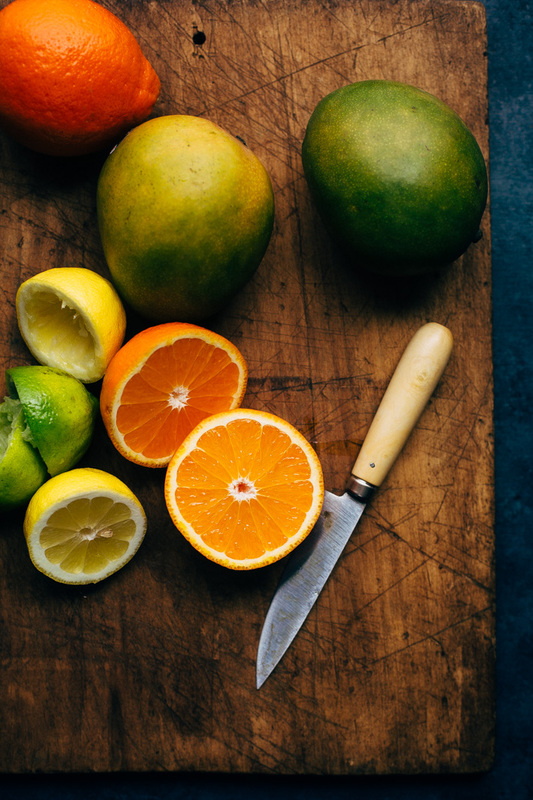 This recipe is all about embracing the last of those winter citrus fruits while keeping our bodies in check. Spring is just around the corner elsewhere. Or is it? In Houston, it was here yesterday, we’re already moving into summer, folks. The last few months have been a hamster wheel of comfort food for us here. When winter means buckets of rain for seven consecutive days in a row and when the sun comes out and it’s for all of about 5 minutes, my life is all about hot foods, cozy soups , and warm spices. 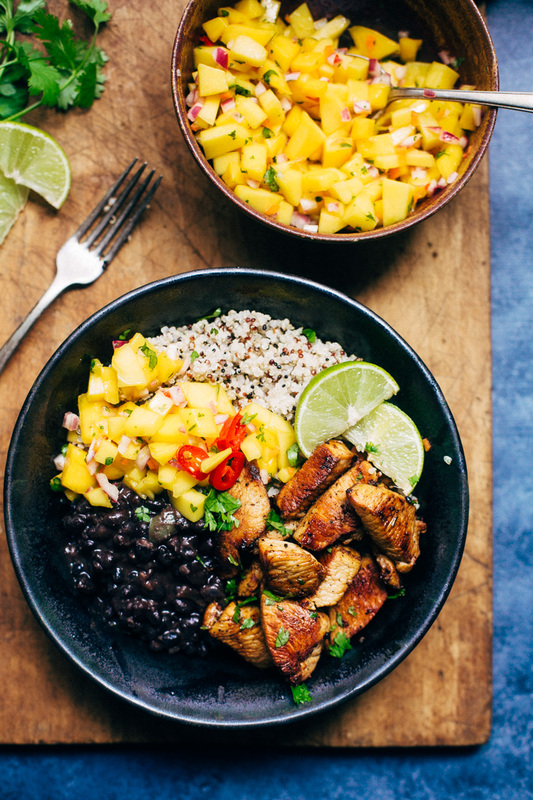 But now that TODAY is March and the weatherman tells me the forecasted high is 80 degrees, it’s only appropriate that we bust out the tropical fruit and make ourselves some feel good food. Let’s talk about the components AKA the individual flavor bombs that come together to make these cuban inspired mojo chicken quinoa bowls. Black beans: This  is my go to recipe for quick homemade black beans. It starts with just a hint of oil, chopped red onions, and chopped jalapeños. We let it all hang out together until it’s nice and fragrant then hit it with some garlic, black beans, a little water and some simple spices like cumin and chipotle chili powder. Just let the black beans braise and stew together. The house will smell fantastic, I promise. And if you’re feeling extra lazy, use the leftover black beans over plain white rice, it’s seriously such a comforting meal! Mango salsa: I can’t even call this a recipe, like what. This mango salsa is a staple in our house! 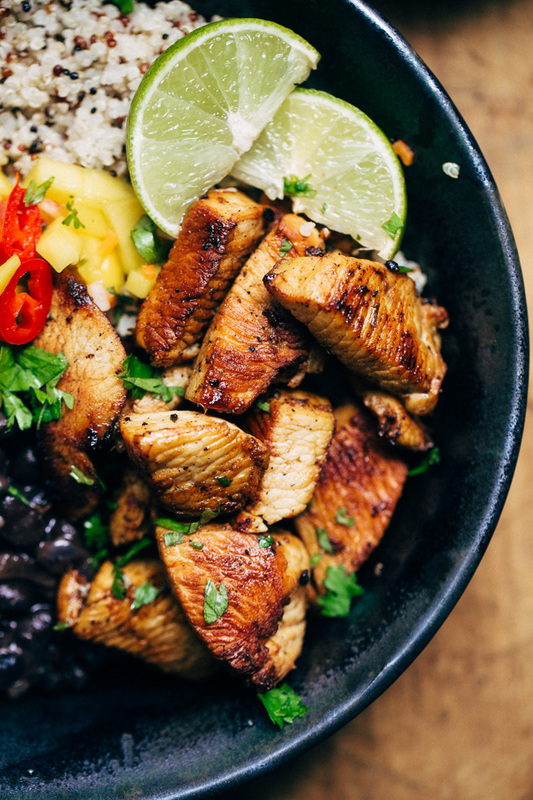 I’ve used it on Jamaican jerk chicken tacos in the past and it’s making a comeback in these cuban chicken quinoa bowls. It’s just a couple of mangoes, ½ a small red onion, chopped cilantro, lime juice, and a small red chili. I used a habanero because we love the contrast of sweet plus spicy. But whatever you do, wash your hands really well because habanero burn has a way of sneaking up on your HOURS after you chop one. No kidding, I was in pain all night after making this stuff. Chicken: This one’s all about the marinade! A few glugs of olive oil, some crushed garlic cloves can you tell we’re headed in the right direction already? Then comes the citrus fruit. Zest that orange. Slice it down the middle and let the fragrance of juicy citrus fruit surround you. Juice that orange along with some limes and a lemon. Combine it all in a bowl with a big pinch of cumin, a couple tablespoons of cilantro, a little cayenne for heat, and some fresh oregano leaves. Let the chicken just mellow out and soak up all that golden nectar for at least 20 minutes. Now, cook the chicken in a screaming hot pan so the flavors all lock in and the chicken caramelizes. I serve this up with quinoa but white rice would be the more traditional way to go. Cauliflower rice is my newest obsession and i’ll tell you, this recipe works well with it. I’ve always drizzled a little oil in a skillet and cooked the caulirice with a pinch of salt, is that how it’s suppose to be done? Someone show me their wise caulirice ways. Here’s to bright, sunny flavors and warm bowls of feel good food. MOJO CHICKEN QUINOA BOWLS MAKE ME HAPPY. chicken: combine 2 tablespoons of olive oil, garlic, orange zest, orange juice, lemon juice, lime juice, cumin, cilantro, cayenne, and oregano in a bowl. Add ¾ teaspoons of salt and ½ teaspoon of black pepper and stir. Add the chicken and allow it to marinate for at least 20 minutes and up to 1 hour. 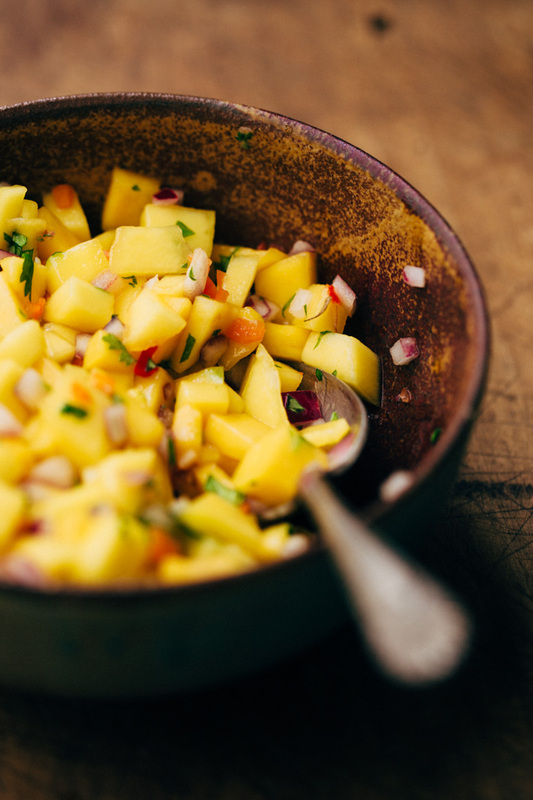 Mango salsa: while the chicken is marinating, prepare the salsa. Combine the ingredients in a medium bowl and stir. If the mangoes aren’t super sweet, you can drizzle a little honey in to amp up the flavor. Refrigerate until ready to serve. Cook the chicken: Heat a skillet over medium high heat. When the skillet it hot, add the remaining tablespoon of oil. Drain the chicken from the marinade and add ⅓ of the chicken to the skillet and let cook for 3-5 minutes or until the chicken is caramelized on the outside and cooked all the way through. Remove to a plate. Add additional oil if needed. Repeat with the remaining chicken. Assemble: Place the quinoa or white rice in the bowls. Top with desired amount of mango salsa, black beans, and cooked chicken. Drizzle with lime juice and top with chopped cilantro if desired, serve immediately. To make this meal quicker: consider making the black beans and the quinoa ahead of time. 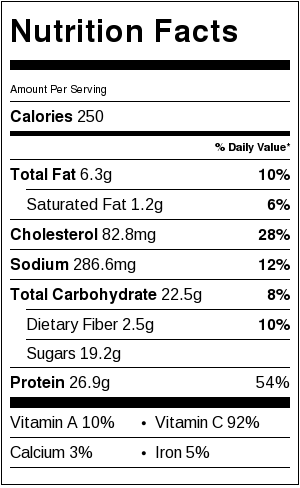 nutritional facts are for chicken and mango salsa only.